Acclaimed course — read the latest feedback from our students! The Mobile Web 1: Best Practices (formerly “Introduction to W3C Mobile Web Best Practices”) online course will help Web designers and content producers who are already familiar with the desktop world to become familiar with the Web as delivered on mobile devices. 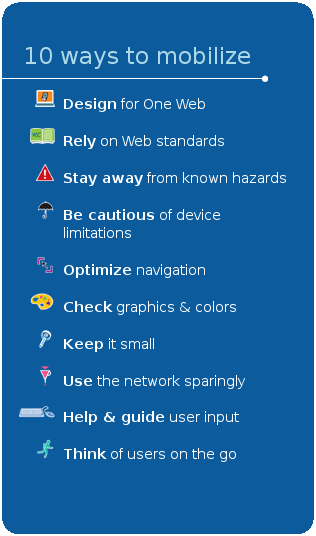 It is based entirely on W3C standards, particularly the Mobile Web Best Practices. After registering and before the course begins you will have access to some preliminary materials that set out the challenges and opportunities of the mobile Web. You are strongly encouraged to try browsing on your mobile device and to introduce yourself to everyone in the group. Web technologies and devices are evolving all the time. As a developer, you’re probably keen to use at least some of the latest HTML and CSS techniques, but which ones are supported by the devices in common usage? In this first week we explore the key idea of progressive enhancement: that is, using a safe set of core technologies and then using, but not relying, on further techniques. The week ends with a practical assignment. This week focuses on the essential factors that lead to good layout for the small screen as opposed to desktop monitors. We’ll look at things like scrolling, images, navigation and the viewport (when is a pixel not a pixel!). Again, there’s a practical assignment at the end of this week but it continues into week 3. This is an area where there has been significant change in only a few years. The original idea for client-side style adaptation have been replaced and improved so that now it’s possible to apply the same concept of progressive Web design as we introduced in week 1. The assignment begun in week 2 is completed this week. Unsurprisingly, the week ends with an assignment that asks you to put what you’ve learned into practice. limitations imposed by battery life. Week 5 is about the techniques you need to use to minimize the impact of these limitations. A short assignment asks you to put these techniques into practice by editing HTML and CSS. Not all of these techniques require you to have access to the server configuration, although some are a lot easier if you do. Rather than a practical assignment, the week ends with a quiz, but you’ll be able to put the techniques into practice directly before the end of the course. The course includes one quiz and four practical tutor-marked assignments (TMAs) that all need to be completed satisfactorily if you want to receive a certificate of completion and a badge*. This course is not for you if you are an experienced mobile Web developer looking for training in advanced techniques. A Web-enabled mobile device with a suitable data plan. In the absence of this, it is possible to rely on emulators, however, an actual mobile device is a better option*. A means to edit HTML and CSS. At least basic image editing software. Facilities for putting documents online. If you don’t have a Web server through which you can easily do this, we recommend you consider using one of the many free web hosting services available such as x10hosting and Free Web Hosting Area (there are many others to choose from too). These are limited accounts (they’re free!) but they should allow you sufficient flexibility to complete the course. * If you have a choice of such devices, so much the better. State-of-the-art high-end devices are not the most suitable devices for use during the course as they give a user experience that is often substantially better than many of the mobile devices in use today. "Awesome contents, nice teacher, good price. You learn a lot"
"I felt that the course sessions information was up to date, well organized, stated the best approaches." "I am confident when I participate in these online courses that I am receiving the latest, most compliant, approach to web development." "It's up to date, useful information." "It made me start learning seriously mobile development." "It is a very good opportunity to learn new technologies. Interact with others in the forum." "Working through practical assignments helped to solidify learning." "I regret that the course has ended so soon - I really enjoyed it." "This is one of the best if not the best online course ever taken." "This is W3C and the training here should be second to none....worldwide!!!" "The course material is excellent, this is really a valuable resource, many thanks." "I really enjoyed being part of an international classroom and learning what is going outside my world." The ever-evolving Web has always kept me busy and I am very lucky to be able to pass on my knowledge through teaching about the Web for various educational institutions. Read more.